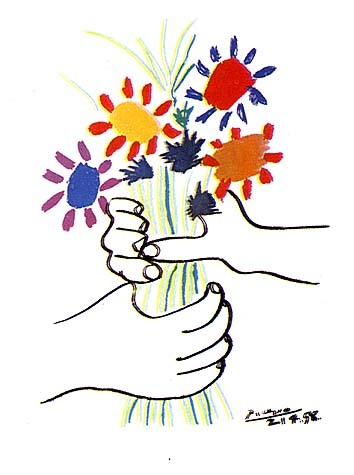 Mother's Day inspiration came from Mr. Picasso this year. I have loved his Hand with Flowers from the first time I saw it. Flowers, kids' hands - just about everything needed to melt a mama's heart. We used brand new from the box markers for bright, vivid colours. The kidlets drew the inside circles firs, and then added the petals, and then the stems. We liked the way that Mr Picasso made the flowers "not too fancy". And very different from Mr Picasso faces. We noticed that they were very different from Geogia O'Keeffe flowers which were bigger than the paper and looked like photographs. My kindergarten teaching buddy suggested that we create a twist on the hands holding the bouquet. 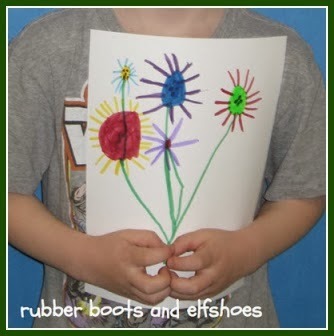 Instead of drawing on the hands, we photographed the kidlets holding their flower pictures. 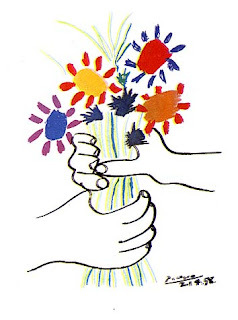 On Mother's Day, the kidlets' mamas will open up a Picasso style flower bouquet and a picture of their child holding the bouquet. Hope they like their surprise. Those are beautiful, Sandi. The moms will love them! The Moms will surely love them. While away at a writer's conference, Hubby and son traced their hands while at a restaurant. I'm glad that page ended up in my "piles of paper." It's on one of my boards around my desk now.